When Anna is dumped by her fiancé, she moves in to her own place on the edge of the gorgeous Wildflower Park and pledges to stay off men and focus on her career, but a handsome new colleague seems to thwart her attempts at every turn. And when she receives an accidental text from a mystery man, could it be the new start she needs? Or someone she really shouldn't be falling for? Review: Well it certainly all kicks off in the last part of this wonderful new series from Bella Osborne. I can't believe just how much stuff happens over the course of this short amount of reading. I was gripped every step of the way as I flew through the final dose of Wildflower park. This made for an excellent end to the series and will make for awesome final chapters when the entire novel comes out in June! We left part 3 on a cliffhanger and so I knew things were going to get exciting for Sophie and Anna in part 4 but boy does everything happen to them. Its so hard to talk about things without giving any spoilers but we do know that Sophie is going to be having a baby at some point and we're going to find out what happens between her and husband Dave. We get to see if Anna decides to conquer some of her fears and how things pan out in the advancement of her career. We also get to find out which path her heart is going to take-all so exciting. I have to say there were some very tense moments in this novella.m There were moments where I feared for these women's safety and their were moments where I wanted to be able to jump in the book and give them some advice. You'll be pleased to know we get to hear from all of the supporting characters again in this instalment. Anna's parents appear, as does Maurice and of course Dave's mum Karen-wonderful! 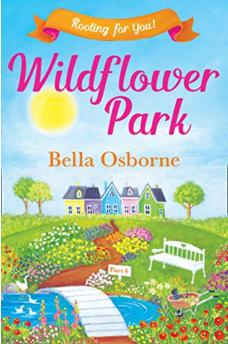 I so enjoyed this and whether your are going to read all four parts separately when this part comes out or wait for the complete Wildflower Park novel, you're in for a treat. I have loved spending time with Sophie and Anna and definitely recommend this book/series. This would be a great addition to your summer TBR. To order part 4 now, just click here.